Looking for a new game for family game night? Try Bananagrams! Bananagrams provided me with these games to review. First we have Bananagrams The Classic Family Anagrams Game. It is perfect for ages 7 and up and can be played with 1-8 players per game. The object of the game is to build an individual word grid using up all of your letter tiles. The first person who uses all of their tiles is the winner. 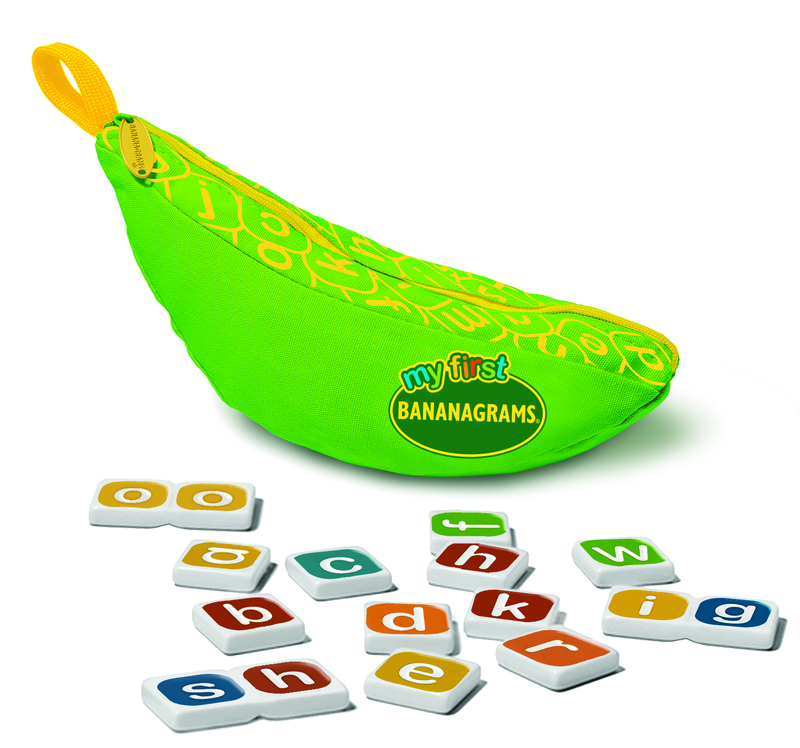 The game consists of 144 letter tiles that can be stored in a washable yellow banana shaped pouch. To begin the game, you place the tiles face down on the table (this is called the "BUNCH") and each player chooses a predetermined amount of tiles according to how many players there are. You then take your tiles and begin forming a word grid trying to use as many tiles as you can. The game continues with players drawing tiles and trading in tiles they can't find a use for until the bunch contains fewer tiles than the number of players. Then the first player to use all their tiles is the winner IF they did not make any mistakes in their word grid. If a mistake is found, then that person is out of the game, their tiles are returned to the bunch and play resumes for the remaining players. This game is lots of fun and was a big hit with my family. This game retails for $14.99 and can be purchased HERE . My First Bananagrams is a modified version of Bananagrams for younger players. It is suitable for ages 4 and up and is for 1-4 players. 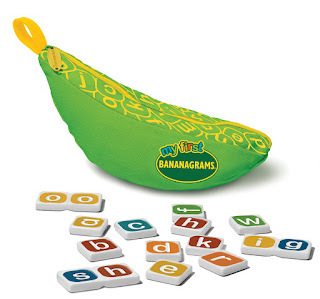 This game consists of 80 single letter tiles and 13 letter combination tiles that come in a green banana shaped pouch. 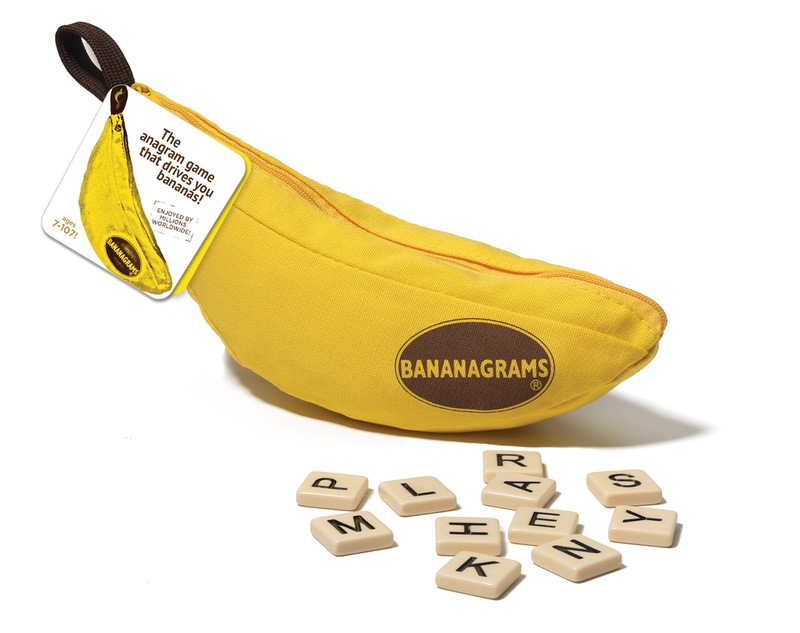 The rules for this game is a simplified version of the rules for the regular Bananagrams, making it easier for younger children to play. These letter combination tiles are the first step in word creation as the children learn to group them together. It also has multiple mini games that together forms a step by step progression of play towards learning to play a full game of Banangrams. My First Bananagrams retails for $14.99 and can be purchased HERE .